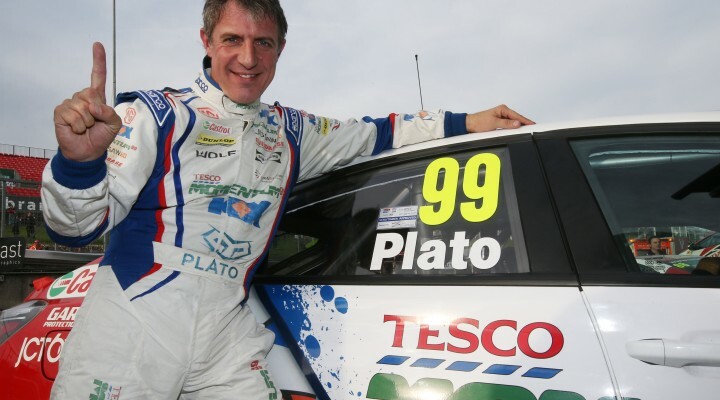 Jason Plato took his fourth pole position of the 2013 Dunlop MSA British Touring Car Championship whilst Matt Neal, who currently sits second in the standings, crashed out of the session after hitting the barrier on the exit of Paddock Hill Bend. Sam Tordoff followed Plato in the time sheets with championship leader Andrew Jordan significantly setting the third fastest time. MG KX Momentum Racing seemed to be in control throughout the running and topped the order midway through the 30-minute session. That was when drama struck for Honda Yuasa Racing’s Neal, who only decided to race yesterday after recently undergoing surgery to repair a badly broken finger. The Honda Civic seemed to dip a wheel in the gravel at the bottom of Paddock Hill, which subsequently fired the car across the track and into the barrier on the inside of the circuit at high speed. The triple champion was clearly in some discomfort immediately after the accident and was taken to the medical centre as a precautionary measure. Neal reported he was ‘disappointed and dazed’ shortly after but the team believe he will be fit to race tomorrow. Qualifying got back underway after a lengthy delay and the MG duo immediately picked up where they had left off with both Plato and young team-mate Tordoff trading blows. The Yorkshireman got to within 0.025s of Plato at one stage before the elder statesmen slightly extended his advantage in the latter stages. Jordan remained cool to set his fastest lap towards the end of his final run, and the series leader will be delighted to have grabbed a second row starting berth with maximum ballast on board. Reigning champion Gordon Shedden was just 0.077s behind Jordan in fourth. Adam Morgan’s eye-catching season continued as he took fifth in his final BTCC qualifying session behind the wheel of a Toyota Avensis. The Ciceley Racing squad is switching to Mercedes machinery for the 2014 season, but before that Morgan will be looking to end this impressive campaign on a high tomorrow. Colin Turkington claimed sixth, but eBay Motors endured a wild qualifying session with Rob Collard going off on two occasions on the exit of Sheene Curve before Turkington repeated the trick. Both cars returned to the track unscathed, as did the Toyotas of David Newsham, Ollie Jackson and Frank Wrathall, who all experienced their own separate spins during qualifying. Tom Onslow-Cole was the top Airwaves Racing runner for the first time since his mid-season switch to the team, although his seventh place was of little comfort to the squad’s other drivers. Mat Jackson could only manage 12th while Aron Smith was unable to contest qualifying after a huge accident in free practice two. The Wrotham-based squad have already worked wonders on the Irishman’s car, however, and expect him to make the grid for Sunday’s finale. Collard and Wrathall made light of their respective spins to take eighth and ninth, ahead of the mightily impressive Jake Hill. The Kent teenager has starred throughout the day on his NGTC debut and he hauled his Audi A4 into the top ten, with his race-winning team-mate Rob Austin down in 13th. The Vauxhall of Lea Wood led the Jack Sears Trophy runners, ahead of Liam Griffin’s Ford Focus and VW Golf of Shaun Hollamby. The final three rounds of the 2013 BTCC season will take place at Brands Hatch tomorrow with live high definition television coverage commencing at 10:45am on ITV4. Pirtek Racing’s Andrew Jordan leads Honda Yuasa Racing’s Matt Neal by 34 points, with Gordon Shedden a further point adrift. Jason Plato and Colin Turkington are tied in fourth and fifth respectively and still have a possibility of taking the title.